Steam will soon add developer and publisher homepages, offering a central location for companies to showcase their wares and organize their offerings. These pages appear to function similarly to the existing curator pages , though with the obvious difference that they’ll be maintained by game makers rather than third parties. These homepages will showcase featured games, host announcements, offer custom background images, and let companies link out to social media locations and official websites. Companies can set up unique tags allowing, for example, a developer specializing in racing games to divide their games by driving subgenres. But really, who needs a publisher to give out a list of great games in a given genre? We could, for example, just tell you all about the best PC simulation games. Companies can also make custom lists for their games, for whatever purposes you might imagine. That could be a permanent list, like a group of games from a given series, or something more temporary, like a list of titles currently on sale. All these options are currently in closed beta, but will become publicly visible on June 18 – which, as SteamDB notes, is just a few days before the expected start of this year’s summer sale. You can find a lot more detail about how it all works in the Steamworks documentation, but that info is largely focused on how developers and publishers will interact with the new system. For us everyday end users, this primarily means that there will be a new look when browsing an individual company’s offerings on Steam. 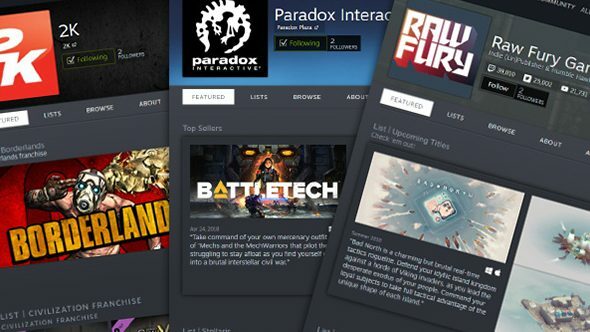 An increased focus on curators – and now on publisher and developer homepages – has been a major part of Valve’s plan for how to handle helping you sift through the massive volume of games available on Steam. Valve recently promised to allow everything that’s not “illegal, or straight up trolling” on Steam, so the floodgates are open as wide as ever. Some sweeping updates are apparently on the way for Steam, from the long-awaited UI redesign to a new chat system, so there’s plenty of change in the pipeline. Whether that’ll be enough to fix Steam’s discoverability problems remains to be seen.